We recently told you about ReachWeather tweak that allows users to add current weather conditions to the empty section of Reachability mode. 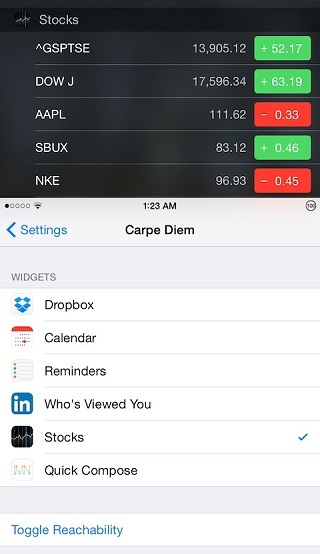 If you liked the idea behind that tweak then Carpe Diem is another hack that you should check out. Carpe Diem takes making use of Reachability’s blank space to the next level by allowing users to choose from a variety of widgets that they can add on their iPhone 6 or iPhone 6 Plus. From tweak’s settings you can simply select the widget that you want to show up in Reachability. Options include Dropbox, Calendar (Today view), Reminders, Who’s Viewed You for LinkedIn, Stocks and Quick Compose for messages and more. Basically this tweak will let you add any stock or third party widget that you can add in the notification center to the Reachability screen, which makes it very cool. After you have selected the widget you want you can simply double tap the Touch ID sensor to see it. Of course even after adding the widget of your choice you will be able to use the Reachability feature just like you could before without any issues. You can download Carpe Diem tweak on your Touch ID featuring iPhone 6 and iPhone 6 Plus at a price of $0.99.